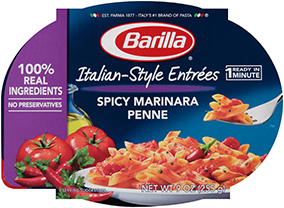 Bring a large pot of water to boil and preheat oven to 375° F.
Cook pasta according to package directions. Drain and toss with 2 tablespoons of olive oil and place the sheets flat on a tray to cool down. In a large skillet, sauté ground beef with 2 tablespoons of olive oil until golden brown and cooked through. Season with salt and pepper. Add marinara sauce and bring to a simmer. In a large bowl, combine cream cheese, sour cream and black beans. Stir to combine and season with salt and pepper. In a 13" x 9” baking dish, spread 1 cup of the meat sauce and top with 4 sheets of lasagne. Spread 1-½ cups of sauce and half the cream cheese mixture then top with 4 more sheets of lasagne. Repeat for one additional layer. For the top layer, add the remaining meat sauce and queso fresco. Cover with foil and bake for 25 minutes. Remove the foil to let the top brown (approximately 5 minutes). Remove from the oven and top with pico de gallo, avocado and a drizzle of lime juice before serving.